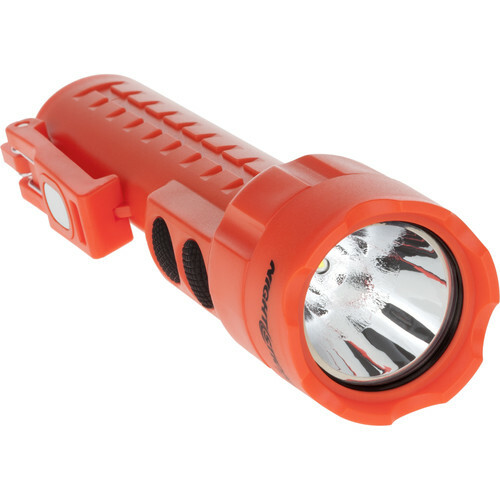 The Nightstick NSP-2422R Multi-Purpose LED Flashlight is a unique combination of flashlight and floodlight that provides you with a versatile and innovative illumination solution. At first blush it looks and feels like a conventional flashlight with a forward-facing Cree LED that produces a 130-lumen beam that is optimized for a far throw. Unlike regular lights, though, a secondary LED is set in the handle just behind the head that produces a 110-lumen floodlight that is emitted at a 90° angle to the primary light—providing critical light for close-up tasks. Using the dual push buttons you can activate either light independently or both at the same time for maximum illumination. The polymer plastic housing is lightweight and durable—being temperature, corrosion, and impact resistant. It is also sealed to be waterproof and submersible to an IPX7 rating. Further separating this light from conventional ones are powerful magnets set into the integrated clip and tailcap that offer multiple hands-free mounting solutions or to simply hold small magnetic items like nuts or bolts.